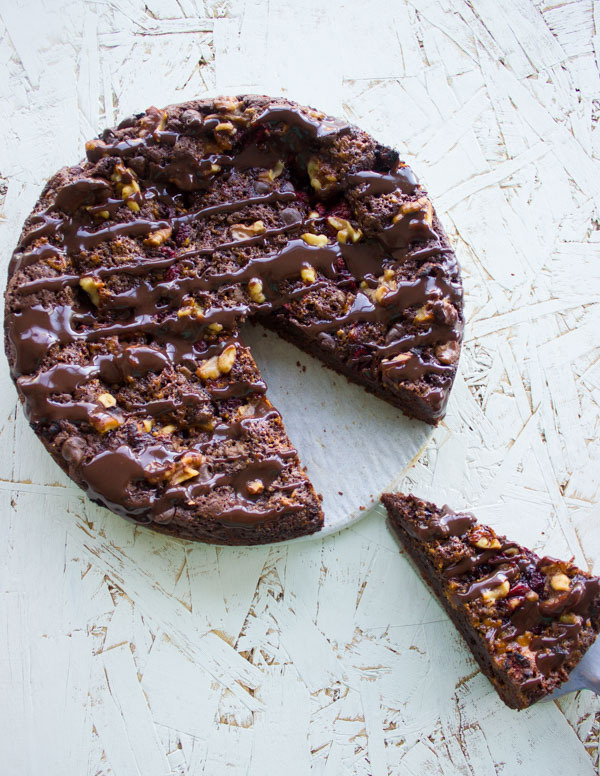 Dreaming of a Baked Double Chocolate Glazed Donut recipe? 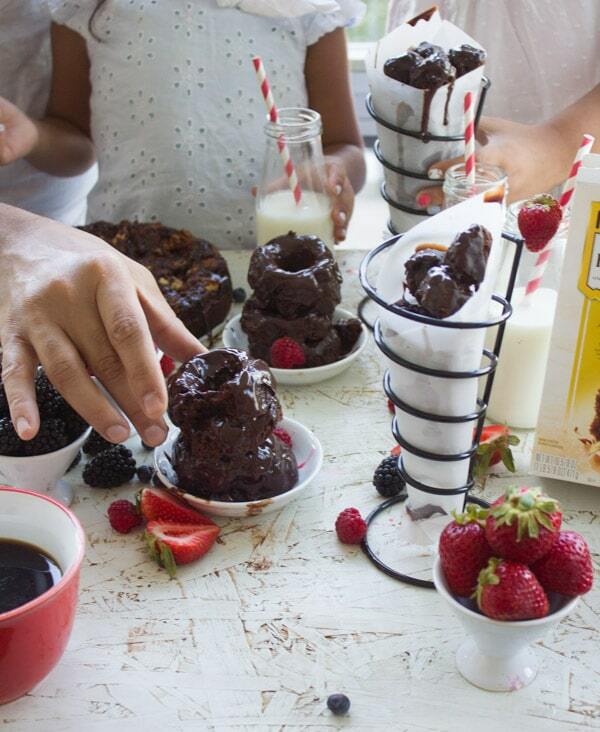 Here’s how to throw a donut baking party in a breeze! Picture divine melt in your mouth baked donuts studded with chocolate chips and drizzled with a velvety smooth two-ingredient chocolate sauce. These Baked Glazed Donuts have the most amazing texture!! The deal with baked donuts is they’re usually very “cake-y”, so when you’re looking for that melt in your mouth fried donut texture, you don’t get that with a regular baked donut…except now! 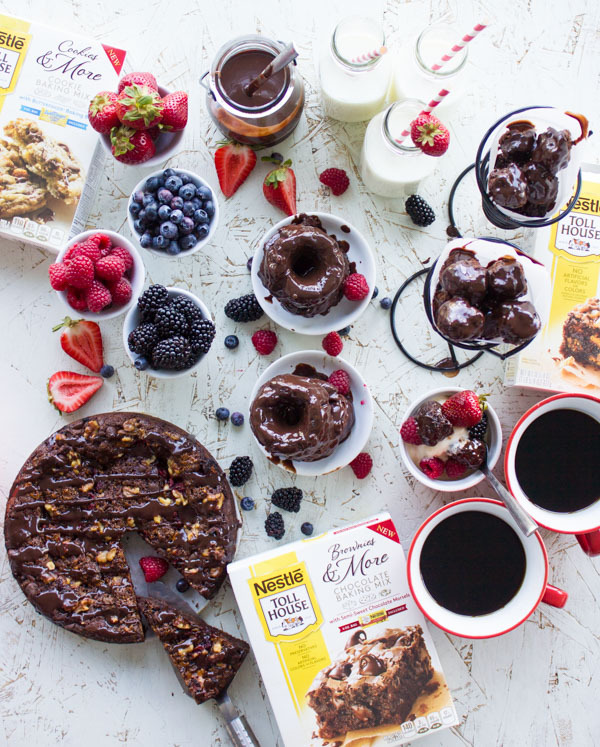 Because these baked Double Chocolate Glazed come from the Nestle Toll House brownie baking mix, they have the melt in your mouth brownie fudge texture. 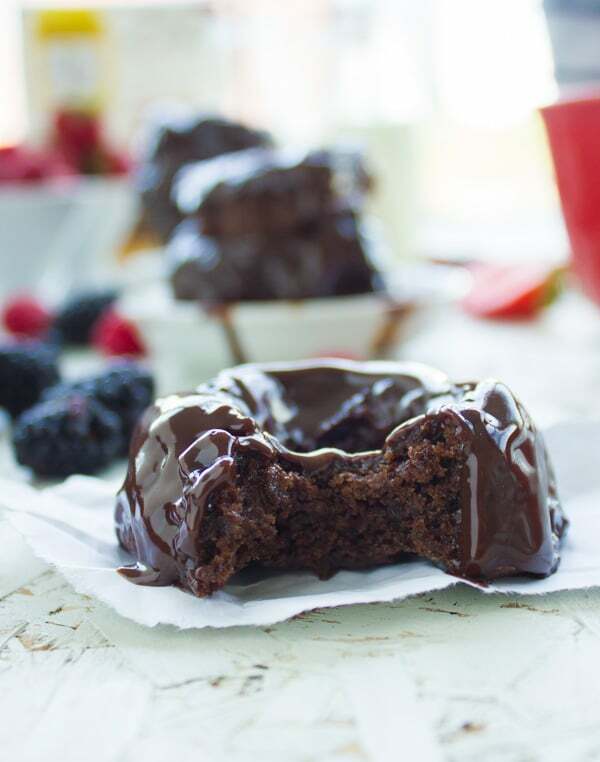 These Baked Double Chocolate Glazed Donuts can be made in a donut baking pan for a classic donut shape, or in a mini muffin pan for bite-size donut holes! Now, how about some coffee, some ice cream and berries—and now watch your friends and their kids fight over those luscious baked donuts! 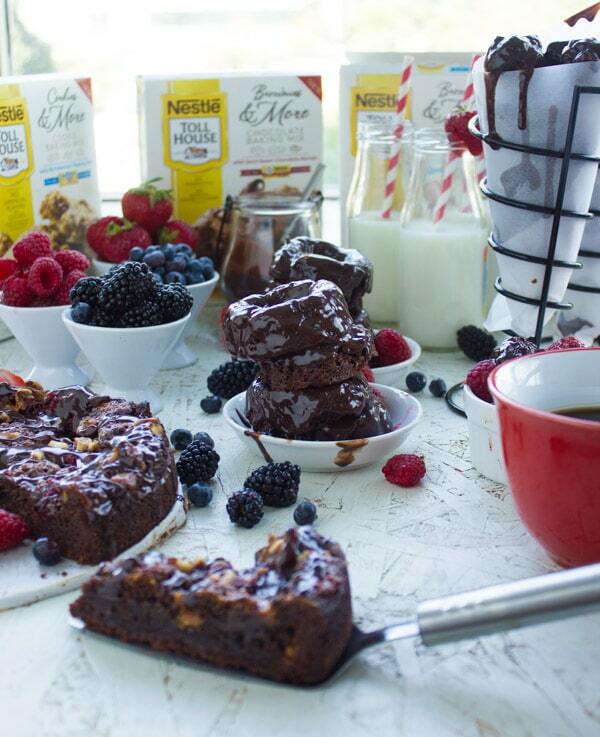 Dearest Reader, if you haven’t it figured out by now—I’ll say it out loud..Yes, I have a Sweet Tooth. And I’m pretty sure you do too. 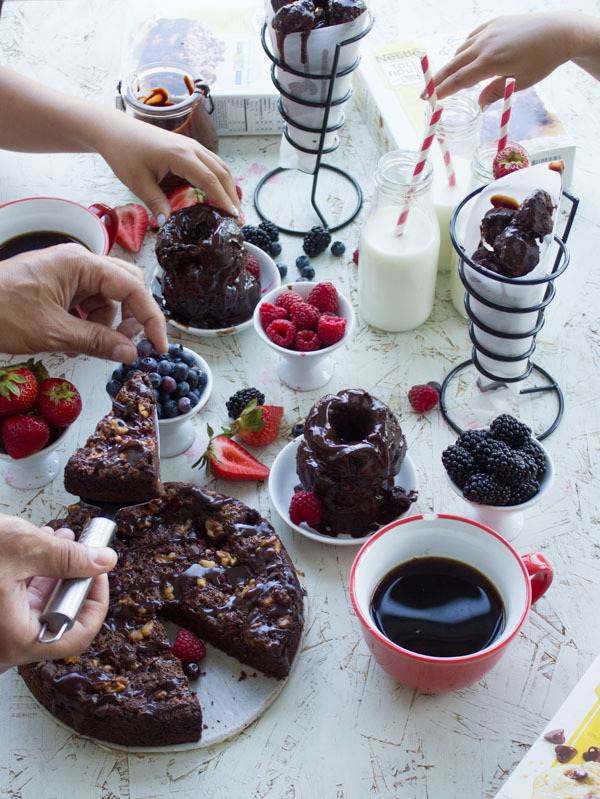 So, now let’s sit back, relax and chat about a fun, easy and fabulous Baked Double Chocolate Glazed Donut party that’s sure to impress. Imagine your baking made easy, convenient and absolutely delicious! For these Glazed donuts, I’m using the Nestle Toll House Brownies and More mix with Chocolate Morsels. Preheat the oven to 250 degrees F. Take a donut baking pan and brush it with oil. Cut out parchment paper into squares ( 2.5 inch) and make a small hole into each square center. Place the parchment squares over each of the cavities in the donut pan to line them well. 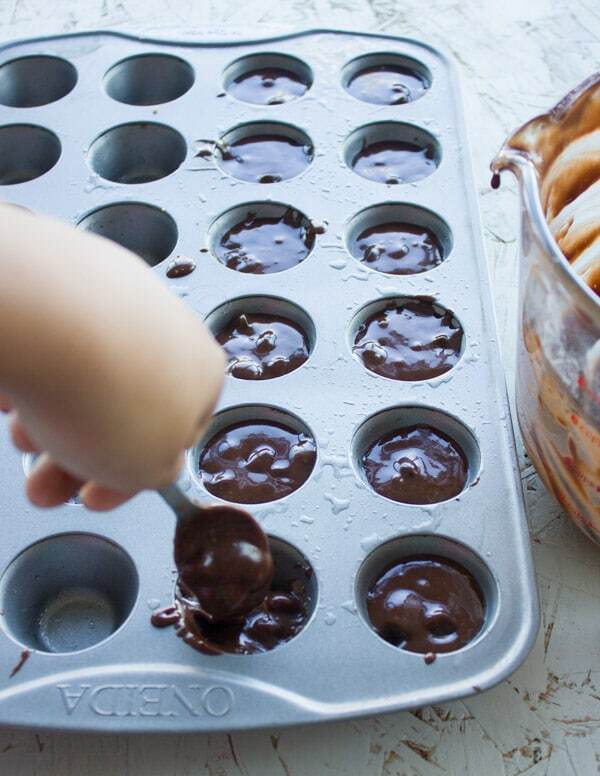 If making the donut holes, line a mini muffin pan with baking cups or brush them very well with oil too. 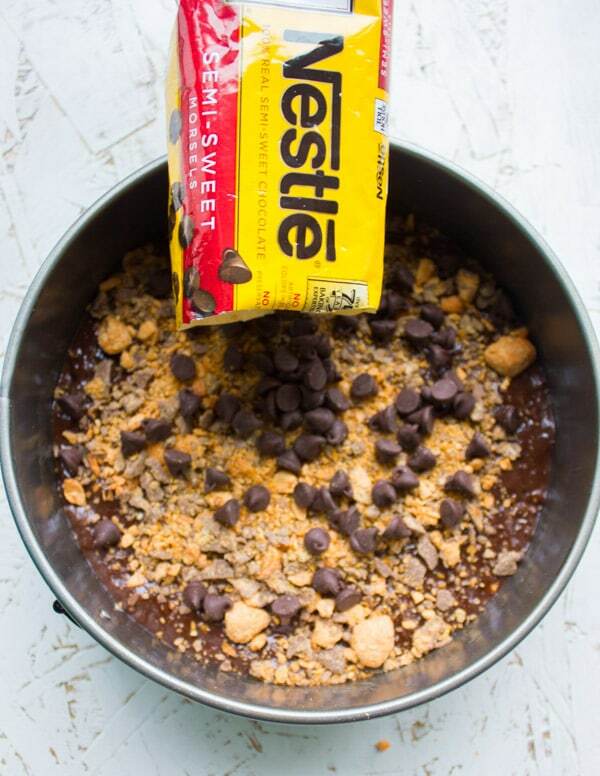 In a large bowl, add the baking mix and baking powder. 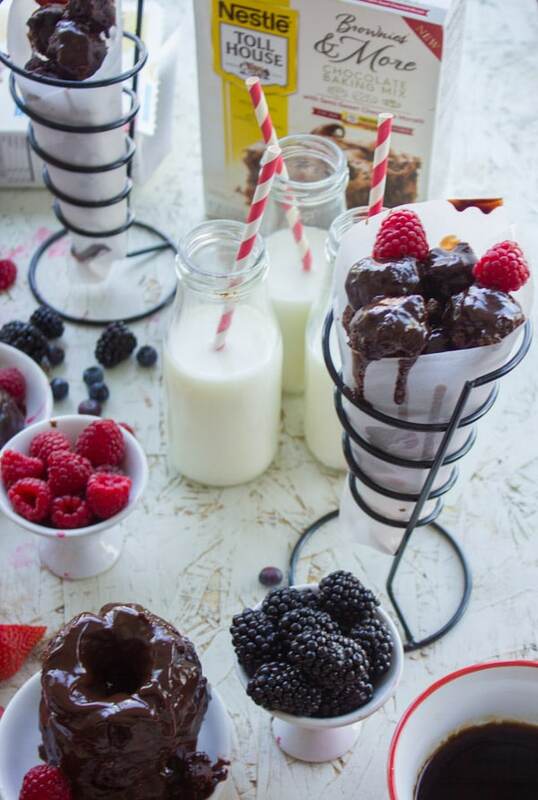 Whisk them to blend. 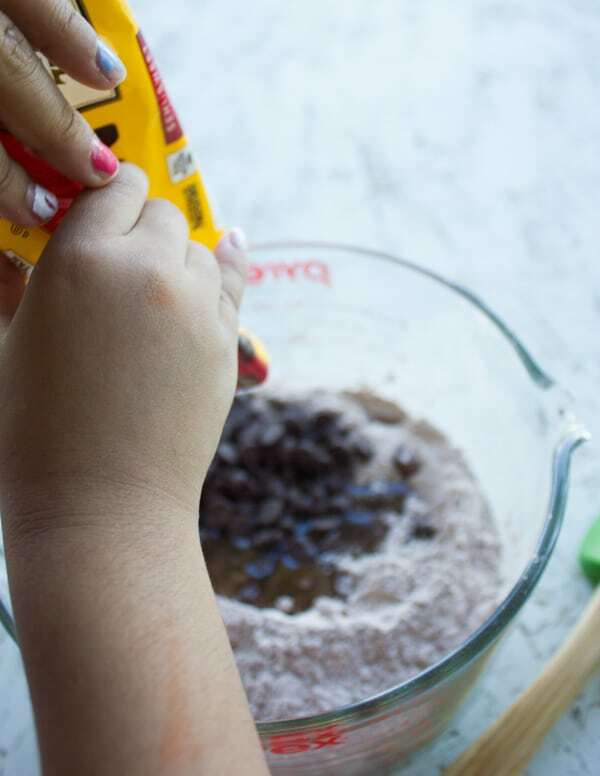 Then add in the egg, water, oil and chocolate chips (from the baking mix a spatula or wooden spoon, mix the batter together until blended. Take a ziplock bag or piping bag, and fill it with the donut batter. 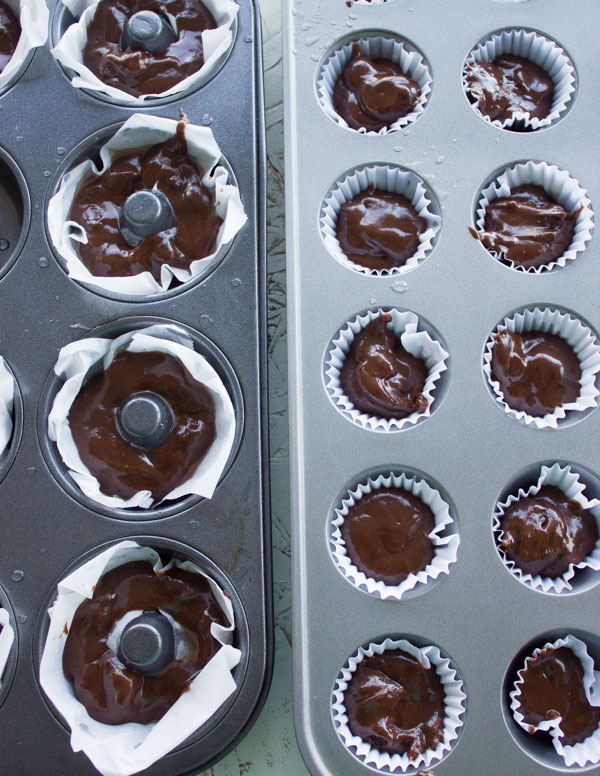 Using a piping bag makes it much easier to get the batter evenly into the baking trays. Fill the donut pans to just about halfway with the donut batter (overfilling the pans will make the donuts rise too much and lose their shapes). Bake the donuts for about 15 minutes until puffed up and done, or for 9 minutes, if baking them in the mini muffin pans. Once the donuts are ready, let them cool in their pans for at least 5 minutes so they can be easily removed. Remove the donuts and peel off any baking paper, then dip the baked donuts one by one (half way or entirely!) in the chocolate glaze. For a different version, baked in a springform pan, I used the NESTLÉ® TOLL HOUSE® Brownies & More Brownie Baking Mix with Butter Fingers. 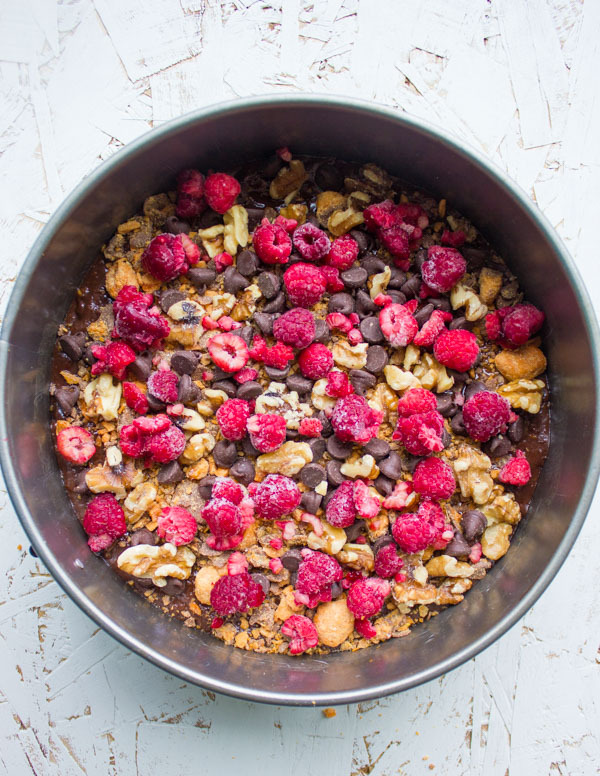 I mixed in half the butterfingers into the batter, spread the batter in a cake pan, and topped it with remaining butterfingers pieces, some Nestle Toll House Chocolate Chips, walnuts and frozen raspberries. Bake for 40 minutes and it’s a celebration! Then simply pour the hot cream over the chocolate and whisk them up. Watch the chocolate melt into a silky satin smooth sauce in seconds! 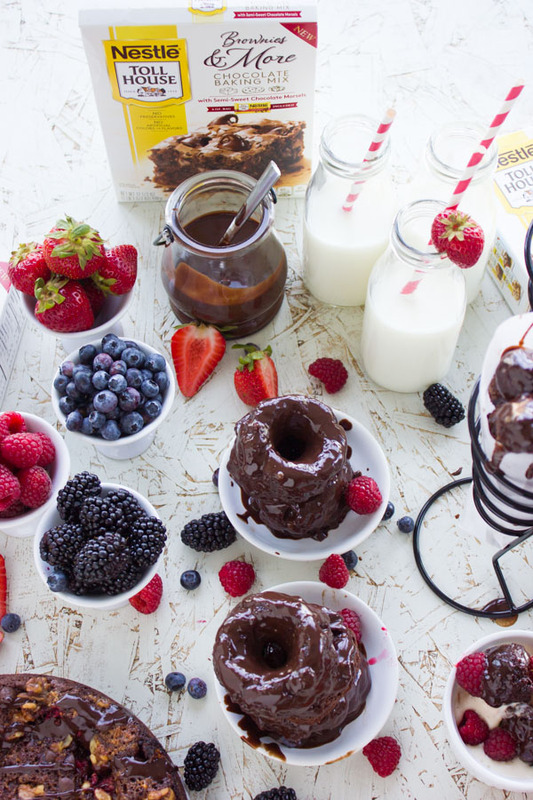 To set up my donut party, I take out some ice cream to serve with my donuts and plenty of fresh berries! There are endless ways to serve up this Glazed Donuts. I serve up the donut holes in a cone, or skewered on toothpicks with some berries, and why skip the ice cream? Or I top up a regular donut with a scoop of ice cream, some extra sauce and a scattering of berries. 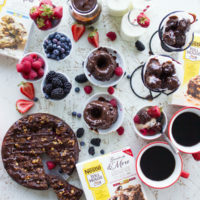 Milk and coffee are my top drinks to have here, so both kids and adults have their baked glazed donuts and drinks their way 🙂 I always have extra berries in cups, they add plenty of freshness and a nice juicy feel to my glazed donuts. I really hope these simple but utterly delicious Baked Double Chocolate Glazed Donuts we made will inspire you to try them yourself. Oil your baking pans very well or use parchment paper/baking cups to make sure the donuts come out easily after baking. If you want to jazz up the chocolate sauce, you can add some salt for a salty chocolate sauce, some vanilla, some espresso, some spice..anything you like. The chocolate sauce keeps very well in the fridge for up to a week, you’ll need to microwave it for 30 minutes before using. The Baked Double Chocolate Glazed Donuts may be prepared a day in advance, but glazed only before serving. These Baked Double Chocolate Glazed Donuts are a chocoholic's dream! Divine melt in your mouth donuts studded with chocolate chips and drizzled with a velvety smooth two-ingredient chocolate sauce. Take a donut baking pan and brush it with oil. Cut out parchment paper into squares ( 2.5 inches) and make a small hole into each square center. Place the parchment squares over each of the cavities in the donut pan to line them well. Otherwise, brush your baking pan well with oil to make sure the donuts come out easily once baked. 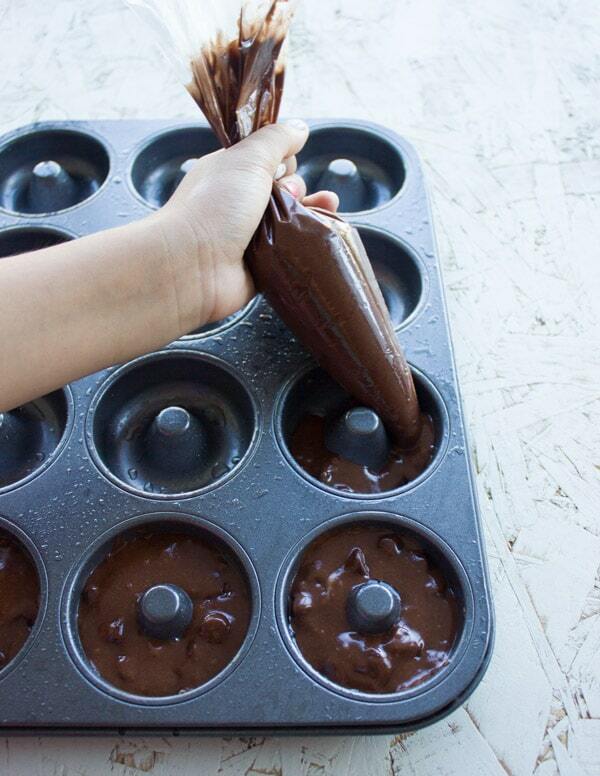 If making the donut holes, line a mini muffin pan with baking cups or brush them very well with oil too. 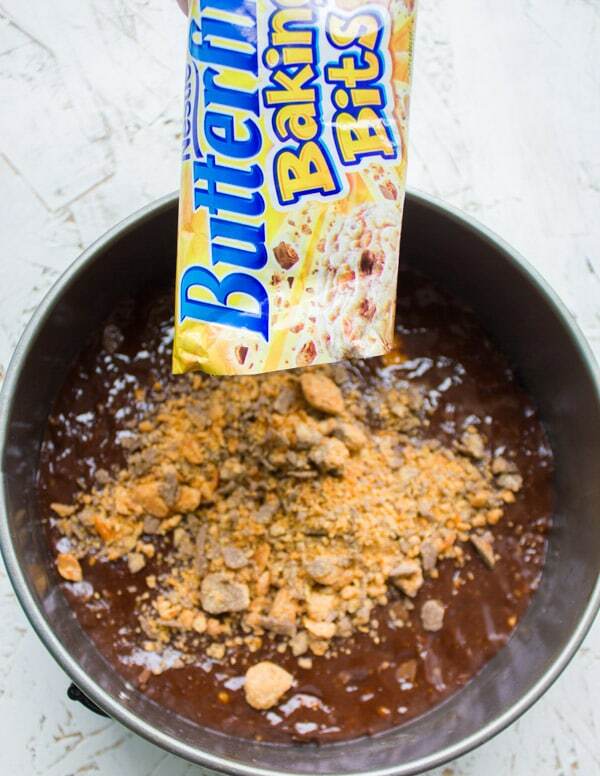 In a large bowl, add the baking mix and baking powder. 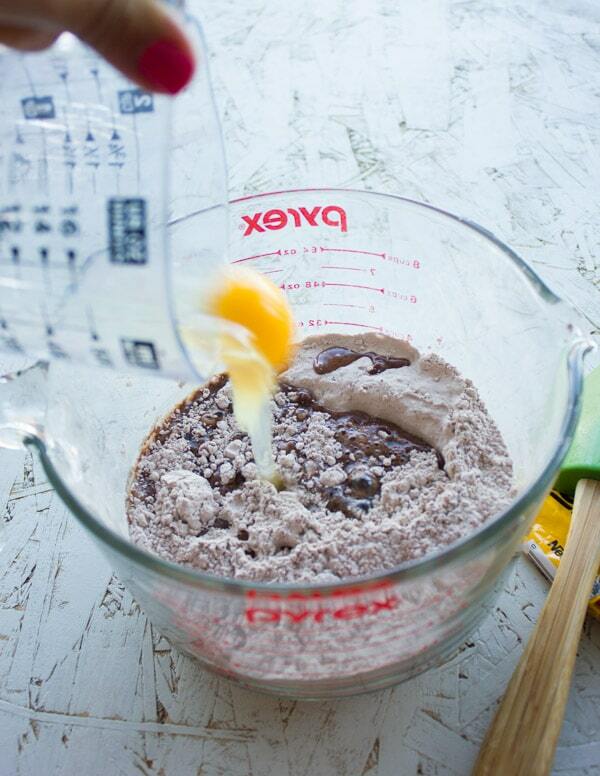 Whisk them to blend. 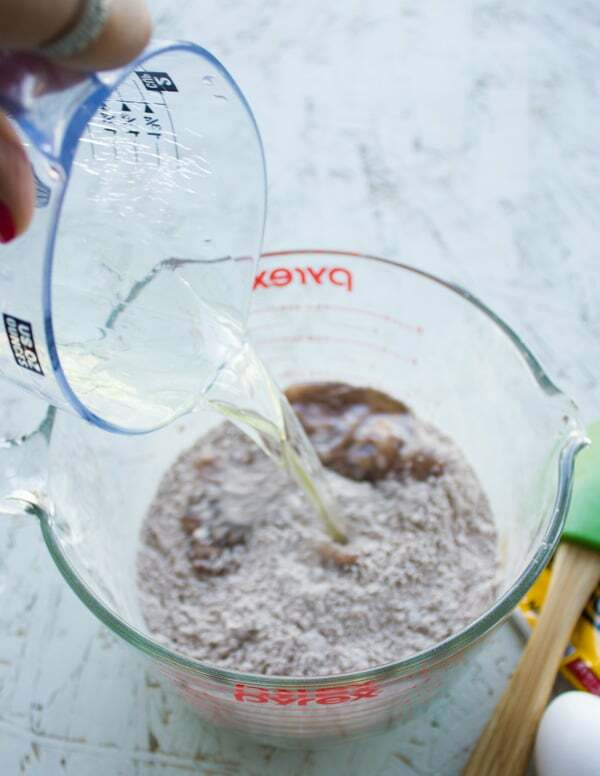 Then add in the egg, water, oil and chocolate chip (from the baking mix) and use a spatula or wooden spoon, mix the batter together until blended. Take a zip loc bag or piping bag, and fill it with the donut batter. Using a piping bag makes it much easier to get the batter evenly into the baking trays. Fill the donut pans to just about halfway with the donut batter (over filling the pans will make the donuts rise too much and lose their shapes). Bake the donuts (donut pan) for about 15 minutes util puffed up and done, or for 9 minutes if baking them in the mini muffin pans. 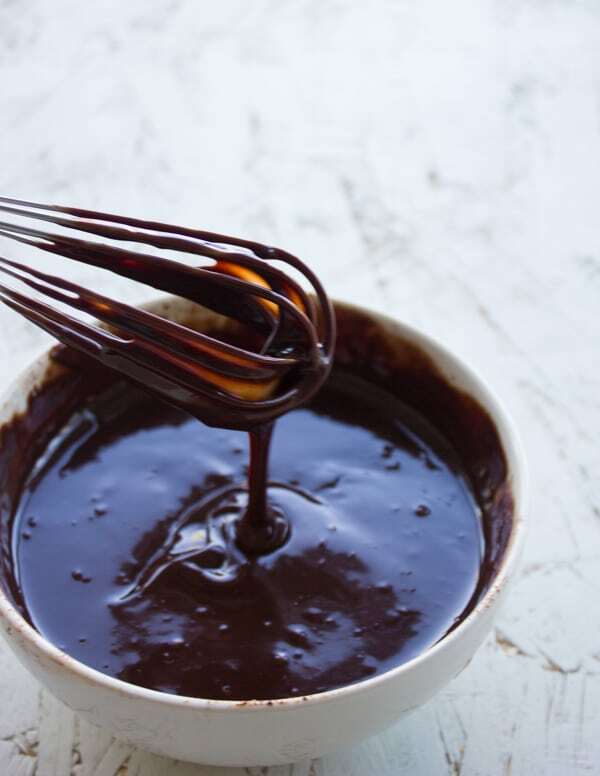 While the donuts are baking, make the chocolate ganache (glaze). 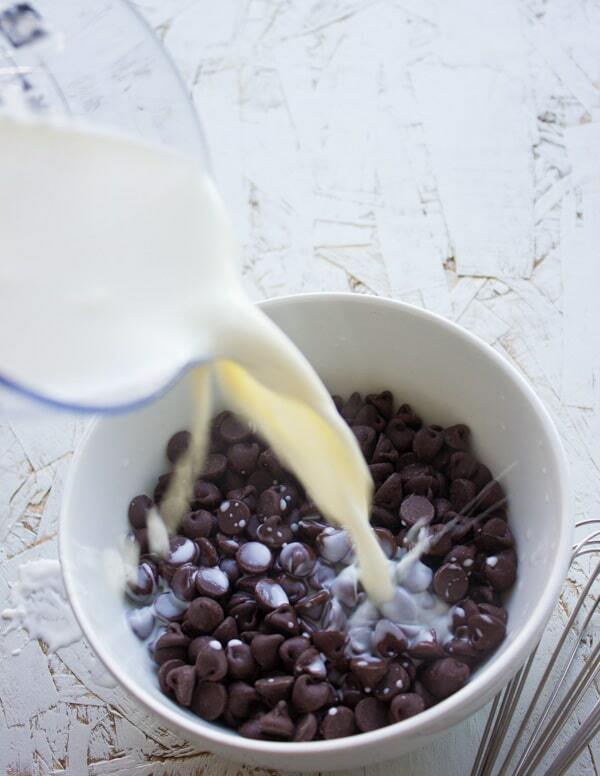 In a medium bowl add the chocolate chips. Heat up the cream in a microwave safe cup or bowl for about 2 minutes (it has to be really hot but not boiling). Then pout the hot cream over the chocolate and use a whisk to blend them together. 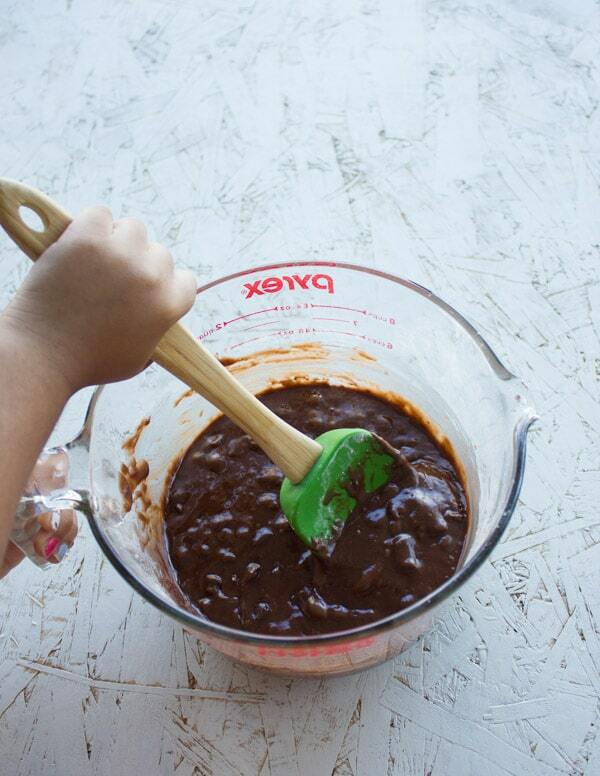 Whisk until the chocolate is entirely melted and the sauce is smooth. Set the sauce aside. Once the donuts are ready, let them cool in their pans for at least 5 minutes so they can be easily removed. Remove the donuts and peel off any baking paper (if using), then dip the donuts one by one (half way or entirely!) in the chocolate sauce, then remove them and plate them. **the chocolate sauce keeps very well in the fridge for up to a week, you'll need to microwave it for 30 minutes before using. **the donuts may be prepared a day in advance, but glazed only before serving. The chocolate sauce keeps very well in the fridge for up to a week, you'll need to microwave it for 30 minutes before using.